Add dimension to your facial hair with our chemical free burgundy henna beard dye, which can be used on the mustache and eyebrows as well. Made with all-natural ingredients, it is a simple product made up of three different raw and unprocessed materials. To build the base, we start off hand selected henna and indigo plants and turn them into 100% pure powder, without any additives or chemicals. The base is then further enhanced with natural red clay to help enhance the red tones in our burgundy henna beard dye. The final mixture is quality checked three times to remove and impurities, ensuring that our users receive the highest quality end product. In addition to providing you with a burgundy color, the raw ingredients also provide a number of benefits such as conditioning. Like our other henna hair dyes, the color is most optimal for light to medium hair and will not be effective on dark hair. Note: Burgundy henna requires an overnight dye release process, that means, after mixing henna powder, please leave it for dye release for at least 8-10 hours for optimal results. First hand red tones come from this powder, made from the leaves of henna plants. With a bright red stain, this ingredient helps to color as well as condition the facial hair, leaving it looking smooth and sleek. Indigo powder is a blue toned, plant-based ingredient. It helps change the shades of the red henna into tones of browns and blacks. Red clay adds in its own tones of deep red to the burgundy henna beard dye. It also provides essential minerals to help cleanse the facial hair, so it looks fresh and clean. Easy to use and fine quality of ingredients. Aroma was little pungent to me but overall, I had a good experience with a totally refreshing beard color. 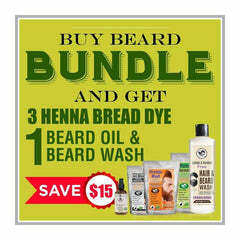 This product was recommended to me by my friend whose beard color was the one I cherish the most. So I asked him and I’m glad about my decision it is totally natural and color is brilliant! My skin is so sensitive that I always avoided using beard dyes because of the irritation afterwards. My friend assured me that it is completely natural and I hesitantly gave it a try and it really worked for me! I can dye my beard without having irritated skin! Fine quality and great results. Perfect for sensitive skin. It causes no irritation or redness afterwards. It is chemical free as promised. Completely original and natural. I used this Burgundy Henna beard dye for the very first time and the result was excellent. Along with beautiful color, it made my hair shiny.